Improving oral hygiene practices may eliminate bad breath, but if brushing, flossing, and rinsing with a fluoride mouthwash twice a day doesn’t stop people from backing away from you when you open your mouth, it’s time to visit Flannagan Dental. If you take care of your implants by practicing good oral hygiene and visit our Anniston, AL office, you should not have any problems with your new dental implants. As always, ask Dr. John Flannagan, Dr. Roy Flannagan Jr. about any questions or concerns you have about you dental implants. If your old holiday routine has gotten stale, leave your green T-shirt in the drawer and try one or all of these tips. Don’t be surprised if you have so much fun that you decide to start a new, annual St. Patrick’s Day tradition! 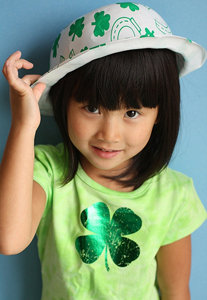 Have a happy St. Paddy’s day from Flannagan Dental! At Flannagan Dental we know that just about anyone who has taken on the challenge of planning her own wedding could tell you how important the little details can be. Things like having complementary colors, the right location, show-stopping flowers, and delicious food are all a big part of planning your spring wedding. Another little detail that has a big "I do" related role? Your smile. This is a season of new beginnings and beauty. Take the time to bring out your most beautiful smile before the big day. Don’t let your smile hold you back on your wedding. With our in-office teeth whitening, you can be sure that you’ll be more confident and comfortable interacting with friends and family. So remember, when in need of some quality oral care in Anniston, AL to think of Dr. John Flannagan, Dr. Roy Flannagan Jr.!